We’ve had something going on that has gotten so out of hand it’s downright comical. I haven’t complained (much) except maybe two tweets and a Facebook status or two over the past year, but the fact is, that I am SO SICK OF THE NOISE that I can’t take it anymore. I don’t even know what quiet daily life (or life with three boys for that matter) even sounds like anymore. Basically, there is absolutely nothing I can do, so I might as well just write about it. When we moved into this house in October 2012, the people in the standalone house to our left were just beginning a project. I think that people lived in there at the time- but it was clear that they were planning something and everyone was going to move out while work was being done. One day a huge blue bin showed up in their front yard. It was hideous and took up a ton of space- and even crept into our driveway which made it a total pain when we had the car in our driveway and were trying to get out of the car and into the house. I thought it was a pity, but meh. Life goes on. The blue bane of my existence. That’s our window to the left, our door, then the neighbor’s door. The bin goes away to be emptied, but always comes back. And now here we are, a little over one year later and I am laughing at my ignorance. I had no idea the scope of this project that our neighbor was undertaking- but wow. If annoyance by a bin in the yard was the start- I don’t think I’d believe where we are today. The back end of the house. There used to be a two-story building here, but has since been ripped out. The tile floor has been removed, and he is adding new plumbing. This is directly below my bedroom window. You can see where some of the walls were removed. Basically there is one guy who is renovating the entire 100 year-old house by himself. The first part of this project was to demo the entire back-end of the house: rip up the tile, brick, framing- everything. When the jackhammering on the floor started this past summer I wasn’t sure I could handle it. On two occasions we had to go next door (we share our backyard gate) and ask him to please stop for the night (9:30pm) since the boys were in bed. It was so loud- I honestly cannot compare it to anything that I know. It was a man with a jackhammer digging up the tile floor in a house. Square by square, inch by inch. 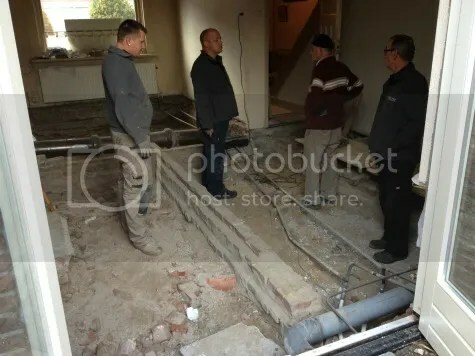 When I thought it couldn’t get much worse than the house vibrating from the jackhammer, it was time for him to demo the brick walls, He started with a sledgehammer and pounded away. When that wouldn’t do he had some kind of crazy brick-saw and was sawing the brick walls off. Do you have any idea how loud it is to saw through brick? It’s loud. And grating. And just absolutely terrible. Over time we have heard so much noise coming from a matter of feet away (I’m talking like at most 20 feet away) I don’t know if I should laugh or cry. I mean, the poor man is doing this all himself- alone, in the rain (most days now) while he and his family live in temporary housing far back in the yard. He put in night spotlights so that he could work later in the evenings since it’s pitch black by 6pm. I feel for the guy- I do. And darn it if I don’t admire his hard work. He often came home on his lunch break (coincidentally also nap time) to bash through some walls. But dude. This is madness. From the looks of things he probably will not finish for the duration that we are living here. We deal with the Neighbor to the Left. Most times on the weekends over the summer when he was doing the toughest, tooth rattling work we took off for the day and didn’t have to listen to it. And now that it’s winter- most of the loud outside work is done and we thought we were safe. From his noise at least. We adore our neighbors to the right. They share this ‘duplex’ unit with us and are the sweetest people. They have helped us out on several occasions, made us holiday treats, and gotten our mail & fed our fish when we’re out-of-town. About three weeks ago their oldest son moved out and from that moment on it has been non stop hammering, banging and tapping from the RIGHT side of our lives. I came home from school today to see these massive bags of sand for the floor base. They happen to be remodeling their downstairs. Good for them! Right? Yeah, I mean- I bet they’ve been waiting for years and years to do this- but holy cannoli now we are experiencing what it sounds like to have tile and brick smashed, removed and broken up from the inside. We share a wall with them too (separated by a crawl space/cellar of sorts) but it is just crazy how loud it can get up in here. Our neighbor invited me in to see the living room. OMG! No wonder! Fortunately the boys are so used to the cacophony that they can nap right through it all, which I find incredible. I, on the other hand, cannot- so on the days they’re doing work I can’t nap. Woe is me. Also (bright side)- that whole ‘worry’ I had over being loud (i.e. yelling) with the boys? Ha. There’s not a snowflake’s chance in hell that I worry about that now. On the one hand I really admire the Dutch quality of these homes. I mean, brick and tile is no joke. The houses around us have to be at least 75-100 years old, ours is almost 100, and they are not even remotely showing signs of wear. A tornado is not going to blow anything down, so if you’re doing a renovation- you bust out the big guns. But what’s the etiquette here? Is it ok to ask how long is this going to go on, and if they can stop after 8pm at night? I have no idea if I am being rude or what. I’ve asked my husband if we would still choose this house had we known all of this business. It would be a tough call since I adore the playroom and the set up is perfect for us. A little noise? We can handle it. That’s about it from the Fabulous Tales of Living Life Abroad. Sounds glamorous, doesn’t it? You’re a better woman than I! I think I’d go off the deep end. We’re temporarily living in an apartment while we try it buy a house and while it’s decently insulated I can’t help but get twitchy at all the neighbourly noise. As far as etiquette goes here I’m not sure but since you seem plenty friendly with your neighbours I’m sure it wouldn’t hurt to let them know when it goes too far for you guys. Luckily your boys sleep through it (how?? Teach me your ways! ) our upstairs neighbour once picked 9pm to start drilling some holes. Ryan woke up so my husband barged upstairs and had a talk with the guy. We were kind of expecting a butting of heads but to our surprise he was really accommodating and apologetic. I have to admit, noise is one of my biggest fears in buying a house in Rotterdam. We all live so close together and you’re just never sure when the neighbours are going to get the urge to redecorate! It’s one of those North American quirks I’m having trouble getting over, that and personal space! I have to credit the sleeping through the noise to their white noise machine. Do you have one? All 3 have used one since birth- and unless the house is shaking (which has only happened on a couple of occasions) they can snooze right through it. Amazing, I know! You make an excellent point too- coming here, we were used to living on a quiet cul de sac where it was NEVER noisy. But I would like to slap my former self when she complained about someone mowing their lawn during naptime. Really? A lawn mower? Phhhhssshhhtt. But personal space is a huge adjustment. And GOOD LUCK to you on the house!! Oh man! You guys got the worst of it, I think. Though, it does seem that just when one project ends in our neighborhood, something new begins. It’s almost as though there’s only ONE construction crew in town or something and they don’t do simultaneous jobs. Even worse are the concrete walls that cause every little noise (probably even the dropping of a pin) to echo throughout the building. We’re in an apartment building, and are part of an HOA (VVE in Dutch), and according to the ‘house rules’, loud noises are not allowed before 10 am and after 10 pm on weekdays. There may be some municipal rules as per your local gemeente for this sort of thing. Might be worth looking into, to know how to proceed if the neighbors don’t respect your requests for quiet time after hours. Best of luck! On two occasions I have thought about checking into the city rules- because we’re talking Saturday and Sunday mornings. Something that I thought was a no no. And clearly we weren’t sleeping in! But it’s nice to not have your teeth rattle out of your head while drinking coffee. Oh my, you are very patient! Our neighbours (we live in a semi detached house) have been renovating since about April. Oh the noise of the jackhammers day after day. Even worse was the mess. BUT the neighbourly thing to do here is to grin and bear it so that’s what we did. It will end and when it’s over you’ll be glad you didn’t complain 🙂 But like you I no longer worry how much noise my kids make, it cannot compare to jackhammers at 8am on a Saturday morning. And side note- can you image the fuss of a neighborhood if this was going on in the states? I just cannot imagine it happening where we lived. But also- the cement and brick just isn’t in our homes these days like it is here. 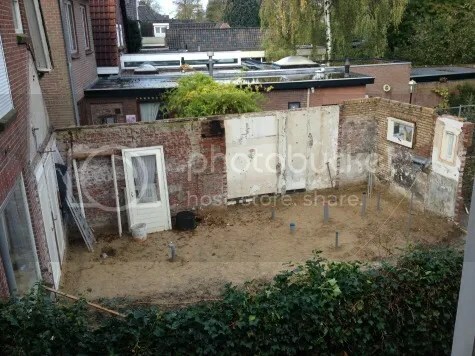 When we lived on the ground floor in Amsterdam the apartment above us was renovated twice, including laying a stone tile floor on Christmas Day, and our neighbor to the right renovated himself over a very long period of time, the wall we shared was the one in Catie’s bedroom. Yay. Then again when we lived on the 14th floor in Chicago, they filmed a Batman movie right outside our building, including all the night shots that required movie lighting at 3am, and the Bat bike revving its engines right outside our windows as it was in the roof of the parking lot across from us. Now that was a nightmare. You’re so lucky that the boys can nap right through all of that noise! Our neighbour has a dog that never stops barking…. I should probably stop complaining about it now. I don’t have it so bad. Oy I’m sorry. That would drive me nuts. We remodeled and I always felt so guilty about the noise factor for our neighbors. A few nights they worked until 9 pm because they were behind but otherwise we made it end by 6ish. Now I live in fear that our neighbors will remodel. 🙂 I hope it ends soon! Or you find some great earplugs! Wow. Glad the boys can sleep through it. What are the odds that the folks to the right would also have a major reno on tap? I hate them. And it doesn’t look like there’s anything we can do. Patrick and everyone else, I feel your pain. I have never come across so many DIY fanatics since I lived in (not any more, thank goodness) the Netherlands. You wouldn’t mind so much if they did a good job and got it done in a reasonable time instead of it taking forever, but they often have to have it redone by a professional when they make a mess of it. I used to wonder where they got the money for all this DIY and professional repair, but I now think they get it by eating only cheese, pindakaas and bread and never going on holiday except for camping or package deals to the Costa del Sewage. When they’re not doing DIY they’re poking their judgmental noses into your life. Because basically they’ve got no lives themselves. I must admit I did not like most Dutch people I met here. Cold, wet country, cold wet (inconsiderate) people. Cosine, I could cry tears of joy at finding someone who thinks exactly like me about the Dutch and DIY. I bought a new build here 3 years ago, being respectful to others I got through all the work required in a week (not much given it’s new, curtain poles and that’s about it) and haven’t made a noise since. For 3 years I’ve had to guess which Dutch neighbour is going to drill and bang Saturday and Sunday away. It’s like there is nothing else to do in this country other than buy a drill at Gamma and go radio rental at home with the walls. No one else complains or finds it annoying while I’m almost in a straight jacket rocking back and forward. I’be tried to look for a detached house but unlike Scotland / the States you need to be earning 1.5 million USD in the Netherlands to buy a detached house. I’m now desperately searching for a job in Italy where my wife is from, dreaming of Saturday and Sunday afternoons meaning a 3 course lunch and a nap instead of hours of drilling with an industrial drill into a shared wall. Currently in the same position. We’ve lived in Amsterdam for a year now and we had a whole year of ‘normal’ noise – people in the building, music, maybe a gathering every now and again but nothing major. In March this year the guy in the apartment opposite sold his flat and whoever bought it decided to rip everything out and re-do it. For 2 months we had to deal with that tool they use for bricks, wood – whatever power tool they could get their hands on at 7/8 AM IN THE MORNING IT SEEMED. It was horrible, the intermittent drilling through brick that sounds like it’s happening in your actual bedroom *shudder*. That was supposed to last a month but went on until May. Also have the same problem so sympathise. I love the city and the buildings, but it feels like building regulations operating times must have been drawn up in the 18th century before power tools. Drilling thru the wall of your bedroom at 7:30am is inhumane. 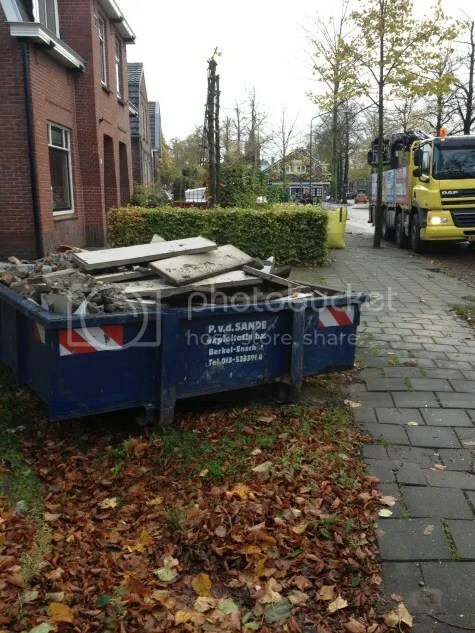 Here on Valeriusstraat, 4 months already, 7 am EVERY DAY. Maybe expats should write a common note to the King about the building regulations? We pay so much taxes in here, they all go to Dutch schools, roads, medicine…Why do we suffer? My God, how I do understand you! We moved into a quiet nice street in the old south of Amsterdam last September (pretty expensive district dare say), full of roses and smiling neighbors with little dogs. And after 3 months our neighbor downstairs started the renovation. The complete DARN RENOVATION and they started it just before the last Christmas when everybody stayed at home to spend their QUIET holidays with families. (how nice of you, guys). My neighbor lied constantly about the deadlines for the demolition.It was 2 weeks, then it became 1 month, then until March. Today is March, 29th, and thus we live in the nightmare of hammers and drilling for 4 months already, and it’s still going on. 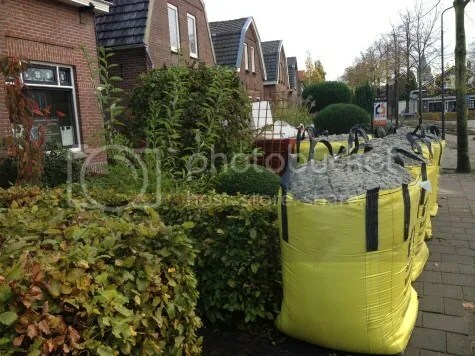 I’m a sound engineer, I found out that the Dutch law states that the average noise level during daytime shouldn’t exceed 35db and 59db in the houses near the highways. My average dose of the noise I get from the demolition of walls, ceilings, and floors in the apartment downstairs reaches about 70-80DB starting at 7 am. EVERY DAY. WE’RE GOING CRAZY! I just wonder, how in the so civilized country like The Netherlands where every bug’, dog’ or duck’s rights are taken into account, HOW the building normative for human beings are so BARBARIAN??? Am I worse than a bug? And it happens all over Amsterdam. What I don’t understand is that my other Dutch neighbors just shut up and quietly endure, saying nothing. And they suffer not less than me. Aarrgggghhh I feel your pain. We have a 11 month old baby, and was woken after a particularly tough night by building at 7am, then it was nap time around 10:30, 5 minutes sleep then drilling starts, he wakes up crying. I complained to the builders and they said oh we should be done for the day. Got him to sleep for his afternoon nap finally and it happened all over again. Complained and he said ‘sorry but we have work to do, can’t work around your baby’s sleep times’. Done some research and seems like nothing I can do right?